In 1913 Louis Feuillade thrilled France with his series of silent movies about Fantomas and his vampire gang. Hotel for Criminals distils these stories into a short, rather bizarre song cycle, with hero journalist Max Beauchamp setting out to investigate the mysterious master criminal and his associate, the sorceress Irma Vep. Created in 1974 by Richard Foreman with music by Grammy award-winning composer Stanley Silverman, Hotel For Criminals is a difficult piece to engage with, especially if you are unfamiliar with the original work. Director and designer Patrick Kennedy adopts a surrealist sensibility to his direction and this is supplemented by alienation elements, which compound its general weirdness. Amidst this melee of absurdist musical theatre, it’s evident that there are great talents at work. Silverman’s score is a rich combination of haunting, discordant phrases and sumptuous melodies that reflect the other-worldliness of the narrative. Foreman’s book may provide all the fluidity of a series of silent movie title cards, but it suits the fractured, staccato style of Kennedy’s direction and singular visual style. A suitably gothic narrator provides an enigmatic voice-over between each scene as the fearless cast embrace the precision of the piece, from the automaton opening to the bizarre Fantomas finale with vampire teeth barred. 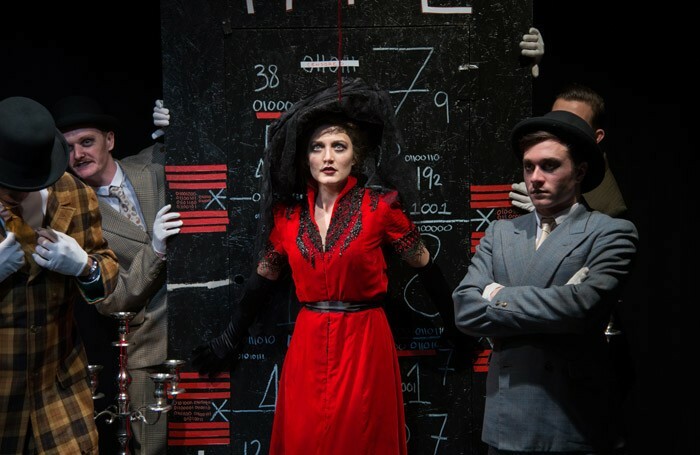 Kate Baxter stands out as a flirty maid who transforms seamlessly into the seductive Irma Vep, but this is an ensemble piece in the truest sense, with each performer collaborating to inform the whole.